Caption slip reads: "Photographer: Snow. Date: 1961-11-11. Reporter: Kirby. Assignment: Lincoln Hts. Parade. 1: L.A. Co. Council VFW color guard North Hollywood Post 10040. 2: Lincoln HS ROTC color guard. 3: Lincoln HS girls drill team. 4: El Sereno Jr. Color Guard. 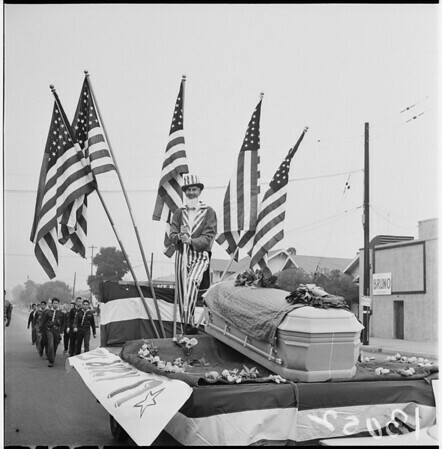 5: Kiwanis Club float depicting Uncle Sam burying communism in a coffin in front of four American flags (waving)".